Have you ever experienced the frustration of not knowing anything about a photo because no one took the time to jot down a date or a name? Photos lose their value and significance if no one recognizes the person, place, or time captured in the image. This is where metadata comes in. Metadata is data about data aka information about the photo. If you’ve been following along with our series on photo organizing, you know that the #1 goal is to preserve our images, to organize them to enjoy and share with family and friends, now and in the future. However, if our future recipients don’t have the information telling them the who, what, when, and where about the images, those pictures we are saving are going to end up as antiques in a consignment shop or in a landfill. So how do we prevent our precious memories from hitting the trash heap? For printed images, write information about the picture on the backs of all your photos. Besides date, write down the name(s), place, and any special story associated with it. For group photos, list the names from left to right. 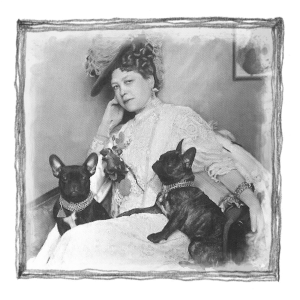 Archival Methods provides some great tips on how to write on your photos safely. If possible, record any stories and have them digitized and transcribed. When you scan your images, make sure to scan the backs of those photos as well so you can input that information into the metadata section of your image file. If your images are scanned or born digital, they have some metadata already stored within the image file, especially if your files are JPEG, TIFF, PSD, or Raw. Exif is a technical metadata standard that provides fields to capture camera model, date created, number of pixels, compression mode, and aperture and shutter settings. IPTC Core is a descriptive metadata standard that provides fields for Title, Author (the person who took the photo), Description, Description writer, and Keywords. PLUS is an administrative standard that provides fields to capture copyright and terms of the license. Unlike Exif metadata where the information is usually stored in the image file once the picture is taken, IPTC Core, PLUS, and other metadata standards contain fields that you need to fill in. Not all metadata is embedded in the image file. Metadata can also be stored externally in a digital asset management system (DAM) or in a “sidecar” file such as XMP. The problem with metadata is that there is no industry standard for how to keep and modify the information. Not all image editing software or operating systems read or display metadata the same way. • One program may allow you to see and edit several fields but another program can only read a fraction of those fields. • You may notice that when you transfer photos into a new program, the program will see the photos as “new” files, overwriting the original date created with the date you are importing your files. • Other programs store your metadata in an internal database instead of embedding the information in the image file. When you export photos outside of the program, your metadata stays with the program unless it provides an option to export the data in an XMP sidecar file alongside your image file. So why should we still spend the time inputting metadata? We want to use metadata to describe why each image matters to us and why it should matter to anyone in the future. Hopefully, you’ve read down this far and understand some of what I’m talking about. If you are getting a headache even thinking about figuring this step out in your photo organizing journey, you are not alone. 1. 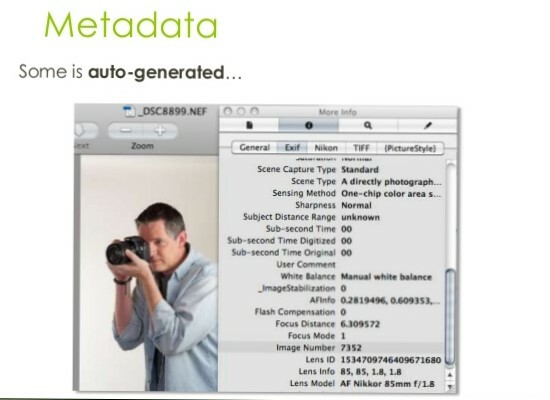 Look at the metadata of your most valued images, add information to as many fields as possible. 2. Look at the programs you are using to store and organize your current photos. Try exporting a few photos to see if your metadata stays with the image or gets stripped. 3. Before working with any new software (or even cloud client), import a few photos and see what metadata fields they show and if they overwrite any information. • Use descriptive filenames that include a date taken, who, what, and where so if an image file is separated from its sidecar file, not all valuable information is lost. • When capturing the name of the person in the photo, use their full name located on their birth certificate, as well as nicknames. • Create a controlled vocabulary to use when describing your photos. Don’t call it an automobile in one photo and a car in another. • Describe groups of people left to right, top to bottom. • Don’t add an “s” to the end of keywords. For example, use “dog” not “dogs” as a keyword. Keywords are a different field than caption; in the caption, you can specify that there was more than one dog pictured. If you made it to the end of this article, I applaud your perseverance. I’ve included some of the valuable resources I found helpful in writing this post below. As you D.I.Y. through your photo organizing project, keep in mind that you’re not alone. We can help add and edit metadata for you and even assist you in creating your own photo organizing plan. Where are you in the process of organizing your photos? What part is going smoothly for you or seems to be stopping you in your tracks? Let me know in the comments below. 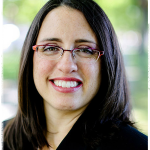 I’m here to help you as you travel down the road towards an organized life! 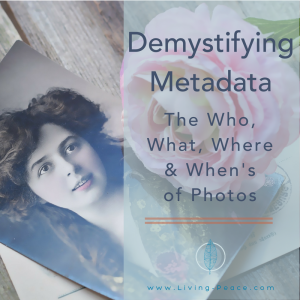 The site, Photo Meta Data, explains the different metadata standards and has a wonderful bento box animation to describe how metadata is stored within an image file. ControlledVocabulary.com shows you how to apply controlled vocabulary to your descriptions and keywords to make it easier for future researchers (aka family and friends) to find a photo they are looking for. They have a great tool, the IPTC Core Map, where they show how a variety of popular programs refer to each IPTC field + a PDF. Exif Pilot Editor offers a Free editor that allows you to look at and edit different metadata standards. There are also videos on YouYube for using the Exif Pilot Editor and doing batch edits. Everything you wanted to know about metadata including standards, discussions and tools for creating embedded metadata can be found at Metadata Deluxe.